There are a lot of decisions to make when constructing a new home. Having a large production builder as our contractor, the task was made somewhat easier with an all-day “selections appointment,” where samples of all the products were presented and a specialist was on hand to answer questions and give guidance. The first thing we tackled in that appointment was the kitchen, since it required so many big investments (cabinets, granite, backsplash tile, etc.) that would inform the rest of our home’s design. The second most important choice: flooring. Having come from a pre-war apartment building with vintage solid oak parquet floors, we knew we wanted wood, but the choices were overwhelming! 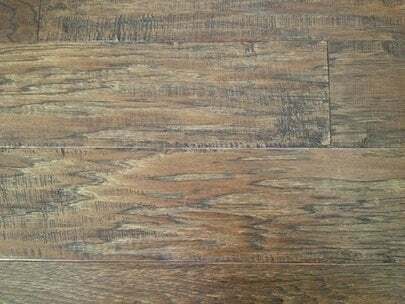 We finally decided on hand-scraped hickory engineered flooring in dark sienna finish. 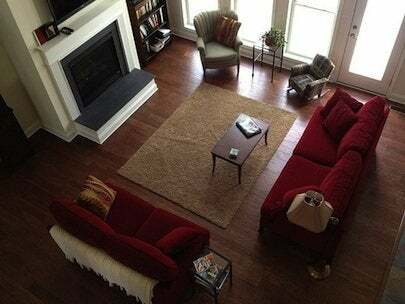 We opted for 5” boards, since the flooring covers a large area of our lower level, and our floor plan is open. 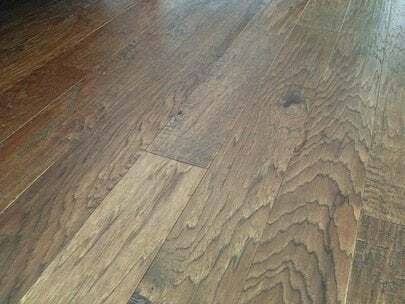 The hand-scraped finish gives the floor a rustic look and hides scratches and dings well—important when you have young children dropping and rolling things all over the place! Hardness: Every species of wood has a rating on the Janka Hardness Scale, which measures the ability of a wood species to resist denting and wear. White Pine is among the softest. Brazilian ebony is among the hardest. Hickory is somewhere in the middle, but harder than both white and red oak. Knowing the traffic patterns of a growing family, we opted for the harder hickory over other options in our price range. Dark vs. Light: Dark floors actually show more dirt than light floors. And they show more wear. Scratches on my dark finish show up much more prominently than they ever did on my unstained oak floors. But the hand-scraped finish makes it easy to remedy with a stain pen or putty stick. Whichever wood flooring you choose, make sure to care for it properly. Regularly sweep and vacuum, minimize water exposure, and clean spills up immediately. Put protectors on furniture and table legs to avoid permanent scratches. I really do love my hand-scraped hickory flooring. I find myself staring at it sometimes, smiling more than is probably normal. Someday I’ll get rugs to cover much of it, but I’m in no hurry.